What happens when the Elves come down with colds am week before Christmas? Santa Claus call on special helpers to work his magic! Can the grandpas and grandmas from around the world save Christmas? Join Santa and his friends on this incredible journey to find out. Santa runs a pretty tight ship in his toy factory. Every elf has a job to do and needs to work hard to get every single toy made by Christmas Eve. Santa believes that the toys are to be made with hands and hearts and not computers. Each toy is made with love for that special boy or girl. On an unexpectedly sunny day, the elves take a break to play snowball which leads to disastrous repercussions for Santa’s toy factory. When Santa and his lead elf try to finish the toys, Santa realizes it just isn’t going to be possible. Then a bright idea leads him to call in the grandparents all over the world. Maybe they can all work together to save Christmas. This is a really great story for Christmas and has a wonderful message about the importance of helping others as well as one about following the rules! Mrs. Claus and an elf warn the others about slacking off on the job. When the elves end up in a difficult situation, they realize that their choices can have consequences. Even though this story has a younger message, it isn’t one your younger child will be able to read to themselves. One page is full of text while the next page has the illustration. It would make for a great bedtime story that is read by a parent. The illustrations are bright and show the range of emotions in the characters. There are numerous details in each illustration that the child will enjoy pointing out. This book would make a great addition to your Christmas library. It’s lesson is a good reminder for all of us. Richard J. Gausselin’s books are inspired by his childhood Christmases of the 1940s and ’50s, when toys were “made with hands and hearts.” As a father of six and grandfather to thirteen, he has enjoyed reading ’TWAS THE NIGHT BEFORE CHRISTMAS on Christmas Eve for over fifty years. 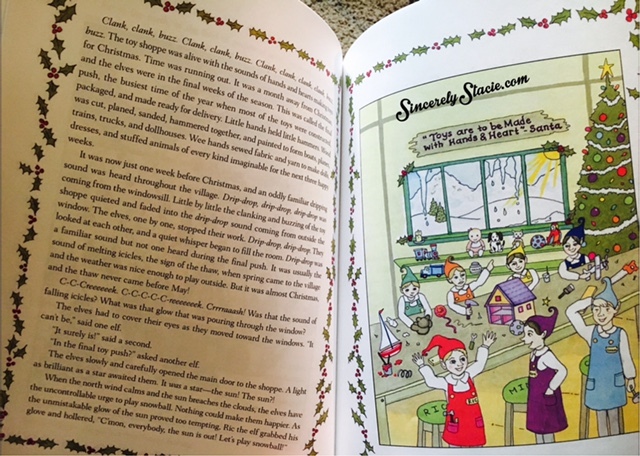 He hopes adults and children will enjoy HOW THE GRANDMAS AND GRANDPAS SAVED CHRISTMAS (Books I, II, and III) and make them part of their holiday tradition. For more on his books, visit his website, HERE. Santa’s elves catch a cold a week before Christmas and can’t work on the toys! Joe, an elder elf, was listening to Santa talk about his grandfather when he came up with the perfect solution – Grandparents. How the Grandmas and Grandpas Saved Christmas is an absolutely delightful Christmas tale. The story is beautifully written and illustrated. The story emphasizes love, friendship, family and does it brilliantly. It is a perfect book to read on Christmas Eve, or to break up into sections to read each day leading up to Christmas. It also has very nice full-page illustrations. Some of them are very detailed, and younger children would have fun picking out toys and tools in the pictures. I highly recommend this thoughtfully written book. Reading this book with your children or grandchildren could be a fun yearly tradition. The elves were making the toys and following Santa’s rule, which was “toys are always made with hands and heart.” When they suddenly became distracted they heard icicles melting which was usually something that occurred in the spring, but today they saw the sun shinning. Ric looked outside and grabbed his glove and said lets play snowball. It was easy for the other elves to stop making toys and go out and play snowball. When Mrs. Claus heard the commotion she reminded them they had a job to finish and time was running out. She gave in and said if they went inside and put on the warm clothes they could play for one hour. Ric told the other elves if we go inside now to get our warm clothes we won’t have time for us to play two innings, lets just play. So going against Mrs. Claus’s wishes that are what they did. Suddenly the sun was gone and it was cold and windy and they tried to run back but were cold and wet. When inside they started making the toys when Mimi started to sneeze and then each of the other elves were also sneezing. When Santa came back with Mrs. Claus he was upset to see the elves behind and Mts. Claus said the elves cannot work as they are sick, they must go right to bed. Santa thought he could handle the remaining list of toys but realized he would never complete the task alone so called Joe the eldest elf to help. They soon realized it was too much for them to do and they needed help and fast. Joe suggested “grandparents” and suddenly the word went out to all the different states that help was needed. As if magically grandparents arrived from far and near and helped Santa complete the list just in time for Christmas Eve. Santa was going to make all the young children’s dreams come true thanks to the grandparents. What a delightful and enjoyable read your children will love. Make sure to get one and include it in your child’s gifts this year. * = courtesy of the book’s Amazon book page.